The Ring of Nibelung is on a Dark Horse Re-Release! Richard Wagner’s The Ring of Nibelung has seen countless adaptations into other forms of media over many years. The opera truly must be seen as it was this composer’s intention. To read a comic book adaptation may seem like a bad idea, but in what I enjoyed in Roy Thomas version is that it helped reignite my interest in the Nordic sagas. The art by Gil Kane was inspiring. This work was published by DC Comics in the 90s; to find it now means chancing upon a collection while at a comic book show. In 2012, Dark Horse Comics released their own version in 2012 with P. Craig Russell handling the chores of not only the writer but also the artist. This edition has its own gentile style and modestly introduces the sagas without being too extravagant in the presentation. It collects all the single issue covers and production notes (on how he turned the opera into an illustrative work) into a 450-page book! His pencil sketches are worth noting more than the finished work–and I’m only scratching the surface. Reading this work is just as enchanting. To compress it (which can clock in at 5 hours, or 15 to detail the entire four-part saga) to a 448-page work is just as impressive. The live performance can be daunting for the newcomer. Not everyone is into opera. To read this work in illustrative form is a great way to become familiar with the story before tackling the stage show. No matter which version I’m looking at, I feel that when I’m done, there’s no need to watch Tolkien’s Lord of the Rings again, for a while. Both share the one ring ideology and borrow from similar sources, and that’s all there is. From Labrador to Vancouver Island, this work does a great job at offering the best-known tales to read before bed. I found The Isle of Demons from way out East particularly sad — a newlywed family was left to fend for themselves there, but its reputation got the better of sailors when they needed help — and for Victoria, British Columbia, my home, to decide on which story is best to spotlight must have been tough. Two are offered: the shade at Beacon Hill Park (too common of an entry in many works for my taste). I had an experience at Hatley Castle, and that’s my number one choice. Understandably, the administration wants to play that down, but the stories and what I heard says it all. Another I’m trying to encounter is the Time Slip on Shelbourne street. I drove through this path many an October night for the past several years. The thought of this path becoming country is theoretically an illusion because when tired, the autumn foliage can trick the mind. I have a slip of paper in a plastic mylar bag to drop to test the theory of, “If you find this note, please find me in the years of 1978 and onwards.” My interest in the paranormal started in that decade. This superlative collection covers favourites like The Dungarvon Whooper, The Ghosts of Fort George and The Banff Springs Hotel. I’m still looking for mention of the Sooke Staircase and feel this piece of folklore is overlooked! Another entry to note about my home province is that no, the doll Mandy did not inspire the Nicolas Cage movie of the same name. The movie took place in the Shadow Mountains of California, and it has its own demons for visitors to deal with. I particularly enjoyed how this work represents the Great White North as a whole. The folklore from Nunavut is most likely still being pieced together. When considering how widespread and isolated citizens are, I firmly believe we have a lot of cabins in the woods scenarios. To find one that’s not akin to Evil Dead will be difficult. The content offered in this collection is reading time well spent. Smith’s prose is easy to follow. Although I know more than half the stories already, they are worth revisiting when the mood strikes. She’s been writing these books since 1993, and her experience shows. She tells these tales as though she’s passing knowledge from one generation to another so that certain aspects of Canada’s past are not forgotten. The loss of lives at sea will always be hard-hitting. Mariner tales, especially “Mysterious Rescue,” early in this book sets the tone. Sometimes, those “Ghostly Footsteps” are just that; the dead has no interaction with the living, but are fleeting memories so we can at least acknowledge their presence. The entry on “Historical Hamilton House” hits all the right notes not only about the rise of Spiritualism in Canada and why many took to it, but also explains the Ackroyd connection. This family’s interest spanned generations and the comedian took ideas to pen the comedy classic Ghostbusters. Barbara Smith’s books are often found in bookstores when the Halloween season arises. This latest work updates a few details. There’s no denying we all love a good ghost story by the campfire, but when we want to go find answers, that’s a different kettle of fish. My advice: just do not try (not many books stand out) and simply enjoy discovering Canada’s past from a supernatural angle. I feel that’s this book’s purpose, as I would love to ride those haunted railways once again. Author Michael Gingold admits to not being much of a horror fan back in 1979. He dabbled with a few films prior but after watching Halloween (god bless his grandparents, so he wrote), that film has changed his life. Anyone who knows this maestro will recognize his contributions to many a publication. From Fangoria to Rue Morgue (and back again), his contributions are well known. 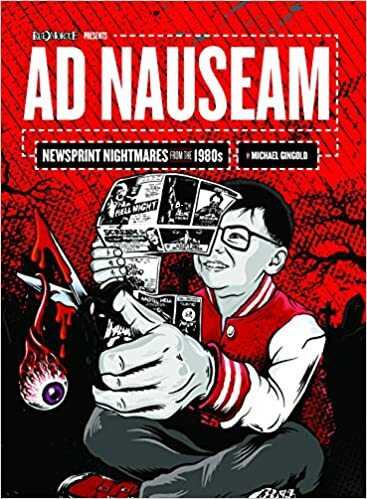 Enter Ad Nauseam: Newsprint Nightmares from the 1980s, a book which took more than a decade to make. It collects nearly all the movie ads of horror films from this era. Flipping through this coffee table book is a conversation starter, especially amongst fans nostalgic for 80s horror movies. This book arrives just in time to before the next installment of Halloween arrives in theatres! Capsule reviews are included to remind readers of what critics back then thought of many a work.